A long time lag in receiving data made it difficult to accurately tie patient satisfaction scores back to specific encounters or incidents, hampering Golden Valley’s ability to “figure out what’s really going on” from an operational perspective. Limited flexibility in creating new surveys for the range of different specialties and services offered at Golden Valley meant that the organization couldn’t adequately tailor and assess the metrics that mattered most for each unit. No ability to customize surveys for appropriate literacy levels – as well as for different languages (especially Spanish) – created confusion among key segments of its patient population. A lack of mobile functionality yielded very low completion rates and thus limited, unreliable data. 30+ health centers in California’s Central Valley. One of the largest Federally Qualified Health Centers in the country. Provides a variety of services that include primary care, behavioral health, dental, women’s health, pediatrics, podiatry and optometry. Joint Commission recognized primary care medical home. Recipient of the Joint Commission’s Gold Seal of Approval. Real time data and insights that allow staff to correlate scores with specific encounters in order to intervene and encourage improvements in clinical workflow, as well as reinforce best practice behaviors among the staff. Flexibility to change or create surveys on the fly in order to gather real time feedback from patients on new initiatives, programs and/or operational changes (such as an adjustment to fees or a clinic’s working hours). Intuitive and friendly surveys that are tailored to the unique needs of each department, as well as to different literacy and language needs within its patient population. Robust dashboards that allow Golden Valley leadership to easily compare and contrast patient satisfaction levels across different sites and providers, and trend this data over time. Dramatically higher completion rates due to the ease and immediacy of administering surveys on an iPad, thus yielding much more abundant data to help guide decision-making. Golden Valley now has an automated means to tie patient satisfaction scores (such as Net Promoter) to performance incentives for front office and medical assistant staff. Clinic managers and executive leadership can check these scores in real time and make any changes as needed. 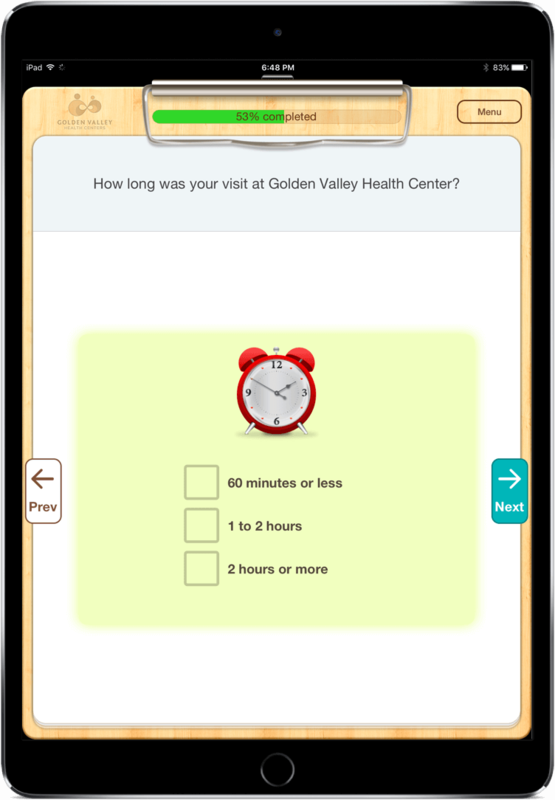 Based on its success with the Tonic platform on iPads, Golden Valley is now planning to use Tonic’s SMS capabilities to roll out the automated delivery of patient satisfaction surveys via text message immediately after an appointment to boost completion rates even further. Golden Valley has also elected to expand its use of Tonic outside of patient satisfaction, where it will soon start using the platform for widespread behavioral health screening across its network. Complete the form below and we’ll show you the magic of Tonic.